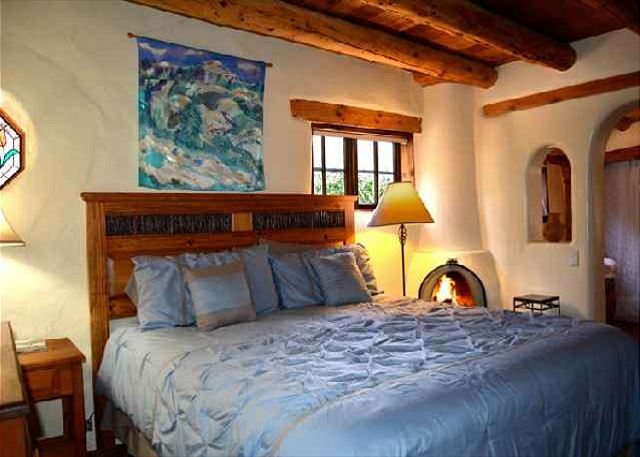 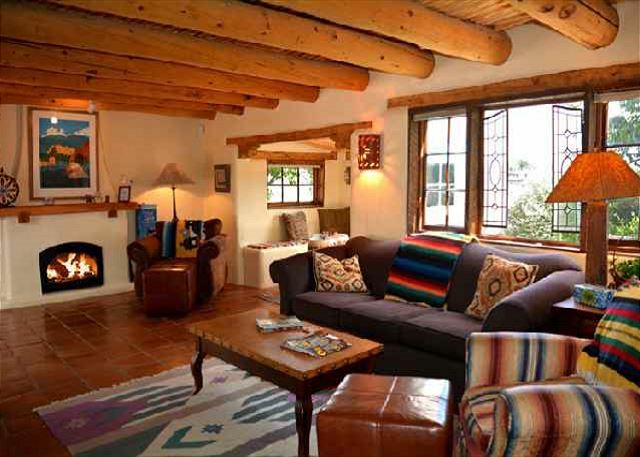 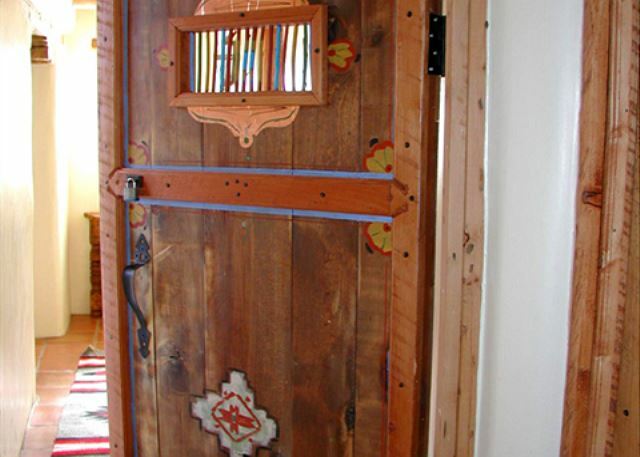 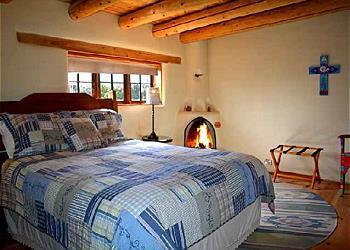 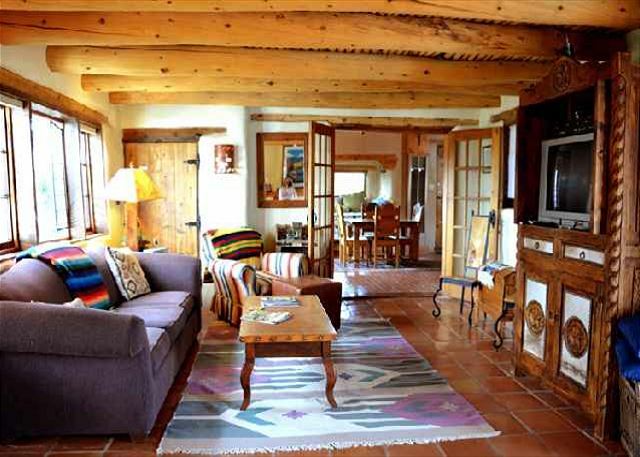 Montana Luz Hacienda “Mountain Light"
A signature Southwest residence, located in a ranching community seven miles from the Town of Taos and approximately nine miles from Taos Ski Valley. 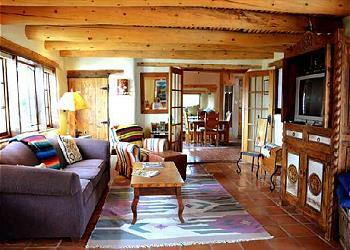 The hacienda is within walking distance to Arroyo Seco on a rural road which passes an old Penitente Morada, cemetery and the back of Julia Roberts’ 50-acre ranch. 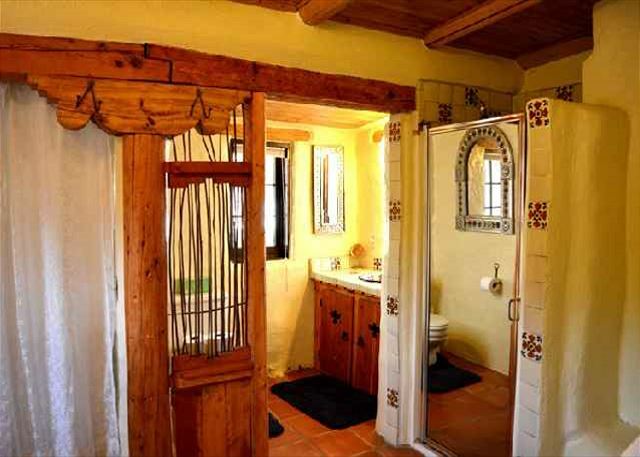 This cozy historic country home was built in the early ‘60s by sisters Sandra and Laurel Seth, Southwest adobe builders who developed a unique building architecture style and design. 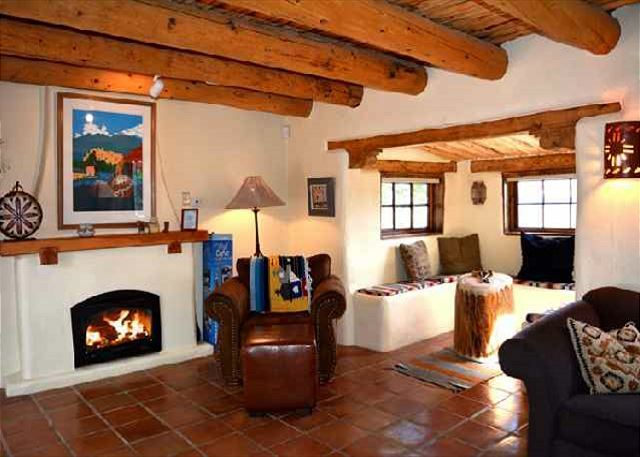 They are authors of the book called “ADOBE!” - also known locally for their use of natural resources, hand-made adobes, brick, flagstone and timbered local wood. 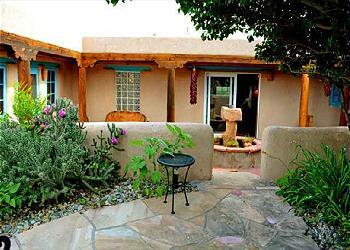 The original 950 square foot structure was built on part of the Antonio Martinez Land Grant. 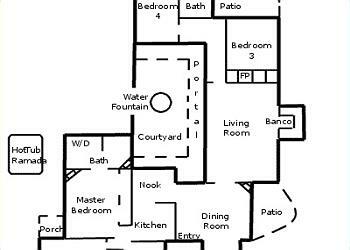 Over the years, different owners have added their touches and more rooms to create what is currently a 3,000 square foot living space. 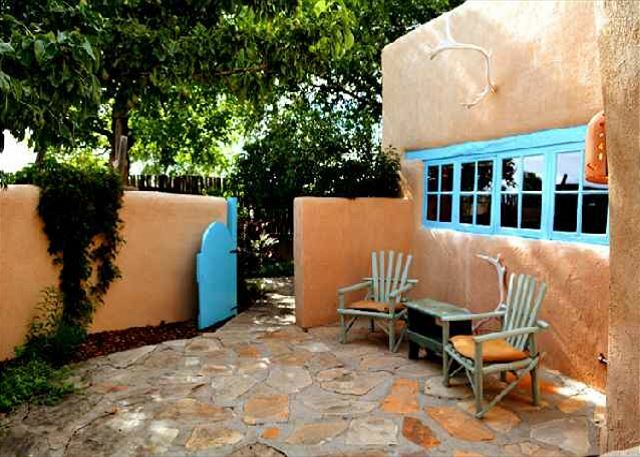 Recently remodeled, the structure features a 400 square foot inner flag stone court yard, portals (covered patio's) for extended outdoor living with access from the kitchen, living room and northeast bedroom and an additional 2,000 square foot flagstone patio and connecting walkways surrounding the entire home. 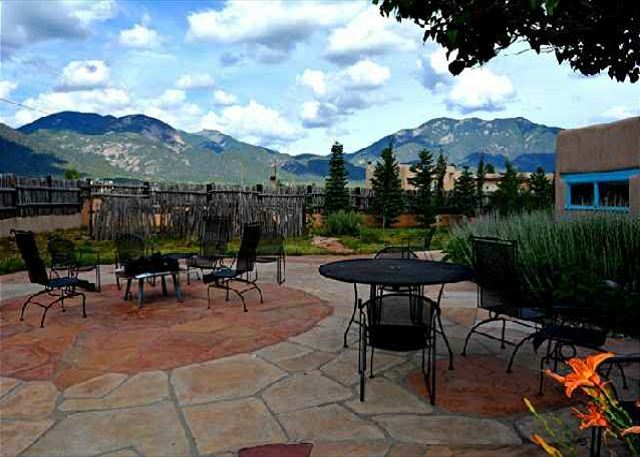 Additionally there is an open ramada with hot tub, sauna, fire pit, several private patios and ample parking. 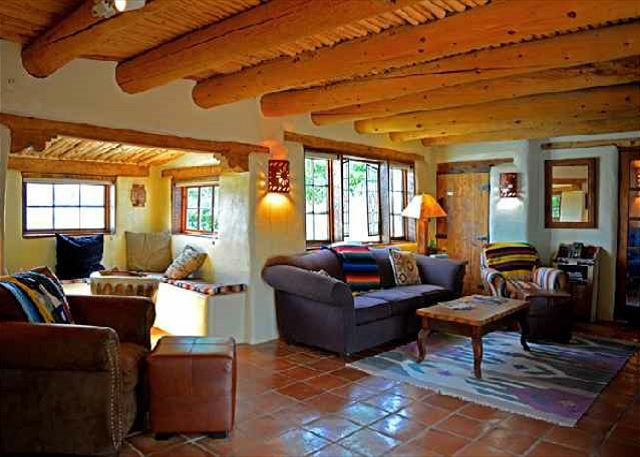 The home is on approximately one acre of land, surrounded by an adobe and latilla (coyote fence) with an electric gate for secured privacy. 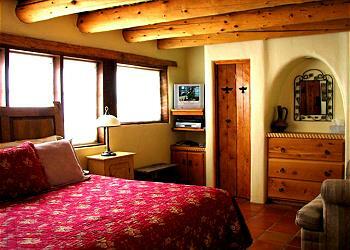 Large viga ceilings are prominent throughout the hacienda, as are Spanish corbels and lintels. 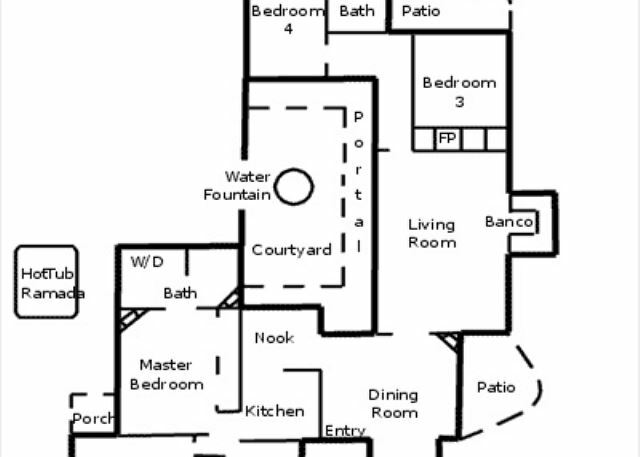 To the immediate left of the front door is an open kitchen with talavera tile counters and custom shelving. An eating area is nestled in a corner with bench seating for eight people. 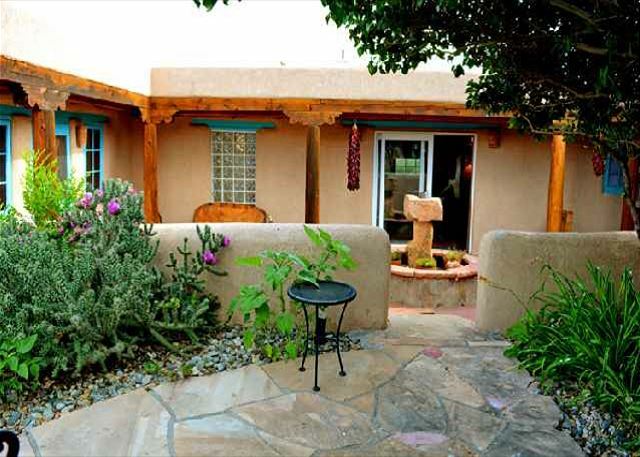 The kitchen is fully equipped with new appliances: refrigerator / freezer with ice maker, electric stove featuring a ceramic surface and overhead microwave, dishwasher, disposal, double sink. Additional appliances include a coffee maker, blender, 4-slot toaster, crock-pot, griddle, hand mixer and flat ware for 16 people. 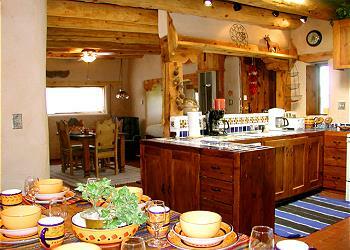 You will find all the necessary kitchen tools to complete any gourmet meal - right down to the wine and brandy glasses. 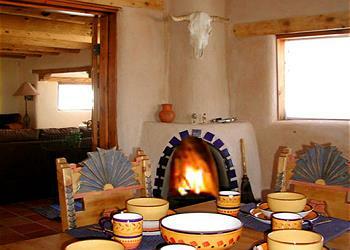 In the dining room opposite the kitchen, a traditional kiva fireplace captures one’s eye. 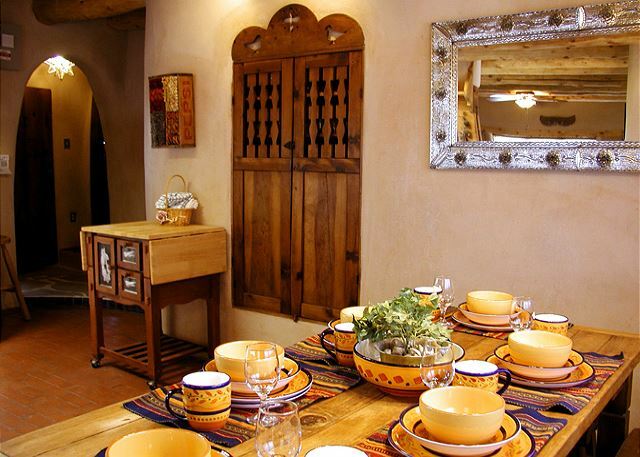 The center of this room also serves as additional table seating for four people. 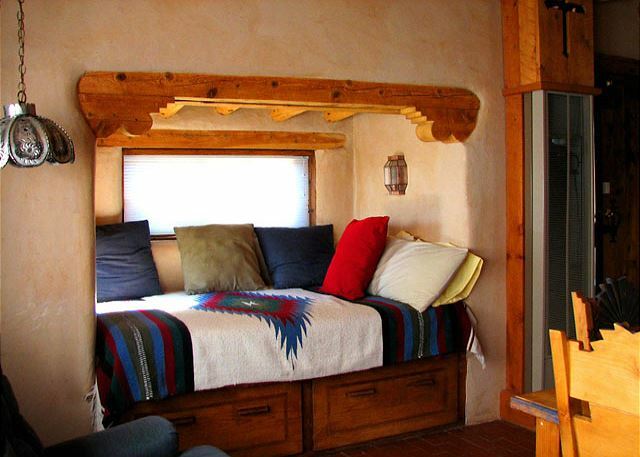 Of particular fascination is the raised window alcove banco (built in bed or bench) with latilla ceiling. 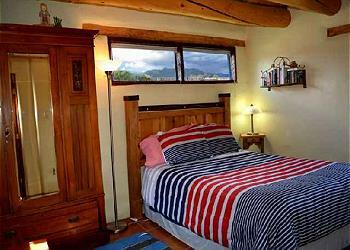 The banco offers extended sleeping for 2 guests on a full size mattress. 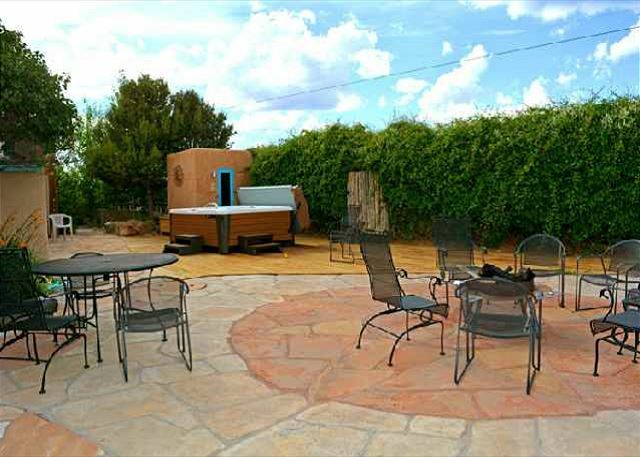 At night, guests enjoy starry skies, glistening snow off the Sangre de Christo Mountain Range and the glowing valley lights of Arroyo Seco while relaxing in the 8 person 14 jet hot tub. 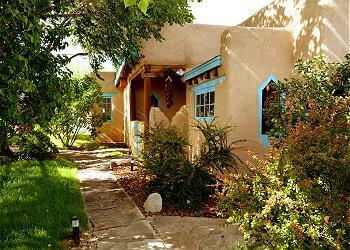 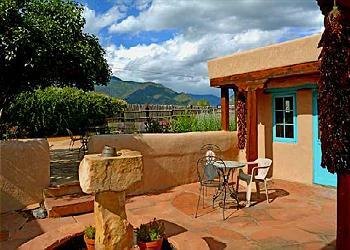 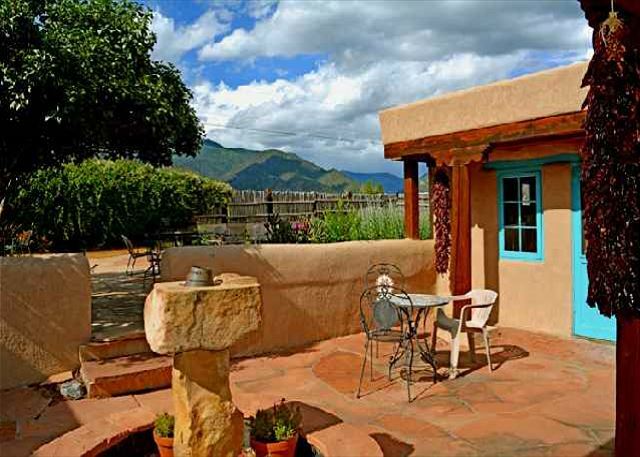 The outdoor sauna is an additional amenity found in only a few Taos vacation rentals. Montana Luz is ideal for families and groups desiring to be together under one very southwest roof for a true Taos experience!